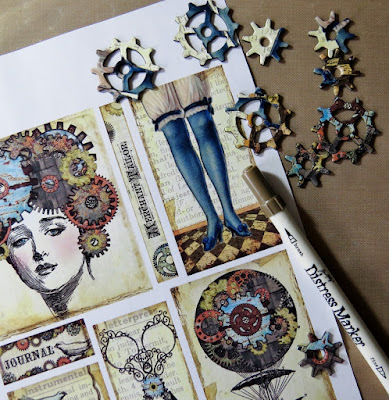 Hi everyone - Julia here.....Today it's my turn to share a Sponsor Spotlight project using some wonderful ephemera images from Stampington who are generously sponsoring our challenge this month. 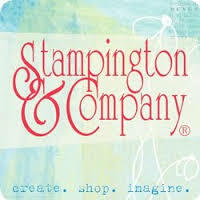 For further details of our latest challenge and Stampington's sponsorship offer, please click here. 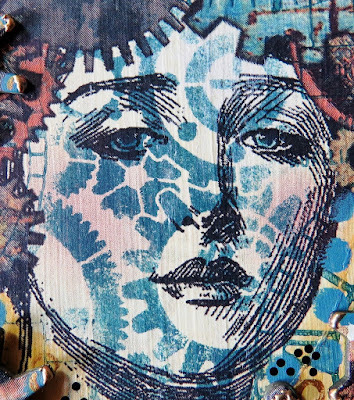 I have chosen to work with a set of images by the talented Debrina Platt and you can find them here. 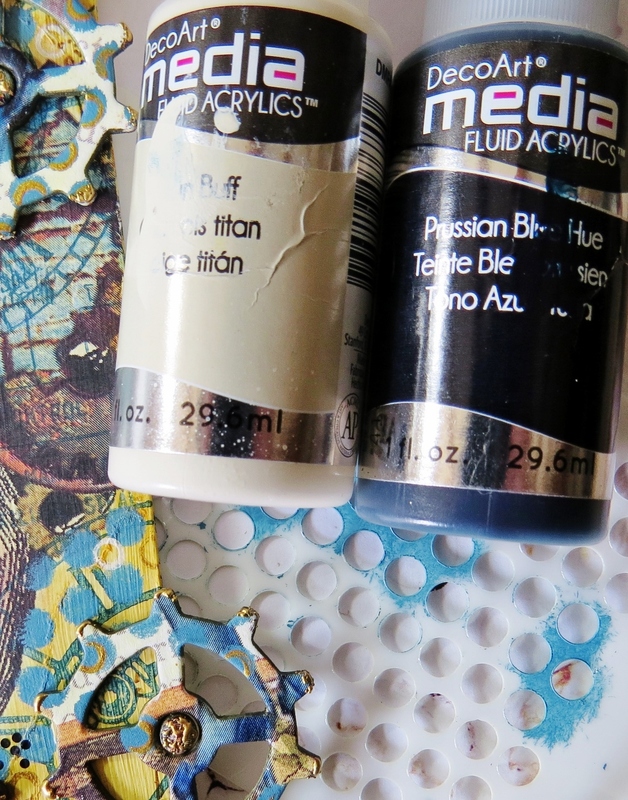 To start a piece of foam board is cut to size and given two coats of titan buff fluid acrylic. Images are then stamped and stencilled in prussian blue fluid acrylic in a random fashion. The chosen image is torn out from the sheet which is printed on a laser printer - you can use an inkjet for image transfer but the results are much better with a laser printout. Make sure you tear and not cut the image out. This prevents hard edges when your image is transferred. Matte Medium is used to transfer the image and you can find the method here. 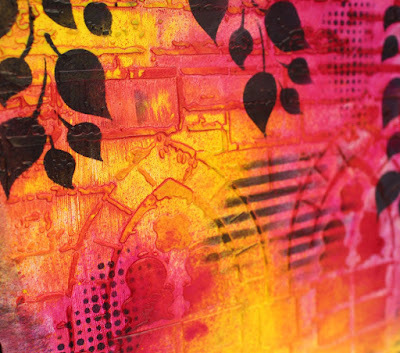 This image shows how the stamped and stencilled background is clearly visible through the transferred image. Even the colour on her cheeks has transferred perfectly - I'm so pleased with my new printer! Some of the printed images are glued to mount board scraps and some cog shapes are die cut. The white edges are inked with the marker. The cogs are stencilled randomly using a mix of titan buff and a tiny amount of prussian blue fluid acrylic. 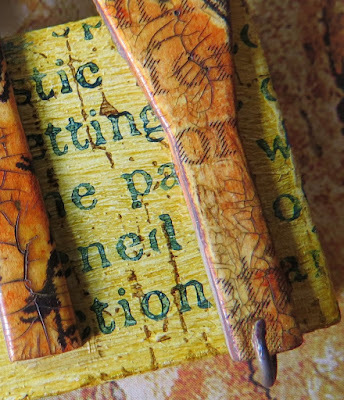 A piece of plastic tube is used to stamp some small rings in gold metallic fluid acrylic. 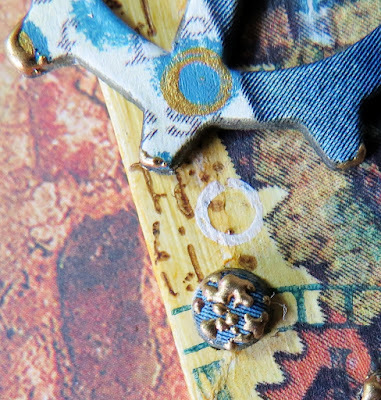 The centre scrap from the die cut is finished with a little aged gold embossing powder. 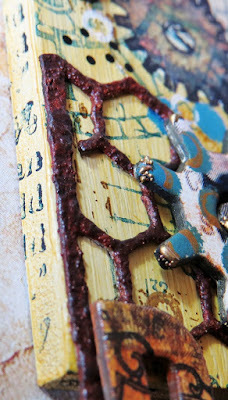 The edges of the cogs are also finished with a little of the same embossing powder. 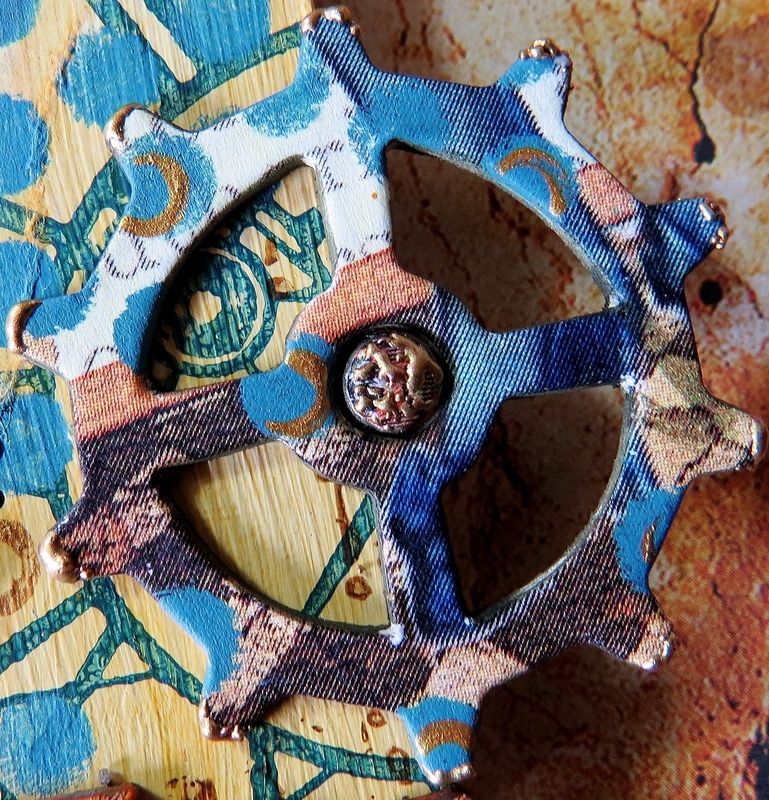 One of the smaller cogs. I love using embossing powder in a random way like this. 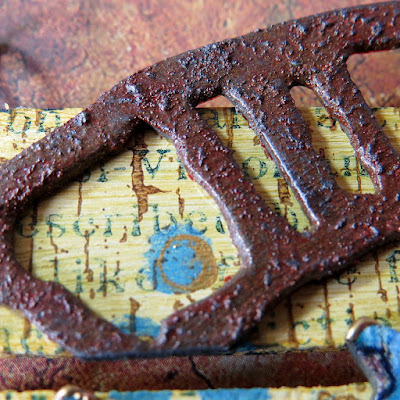 The rusted mesh in this image is a die cut which has been given a quick paint rust finish and then applied over the base. A cog is then attached to the mesh. The edges of the foam board are painted and stamped as described earlier. The little black dots near the top of the image are rub ons. An extra piece of foam board has been added using rusty wire at the top and the bottom of the project. 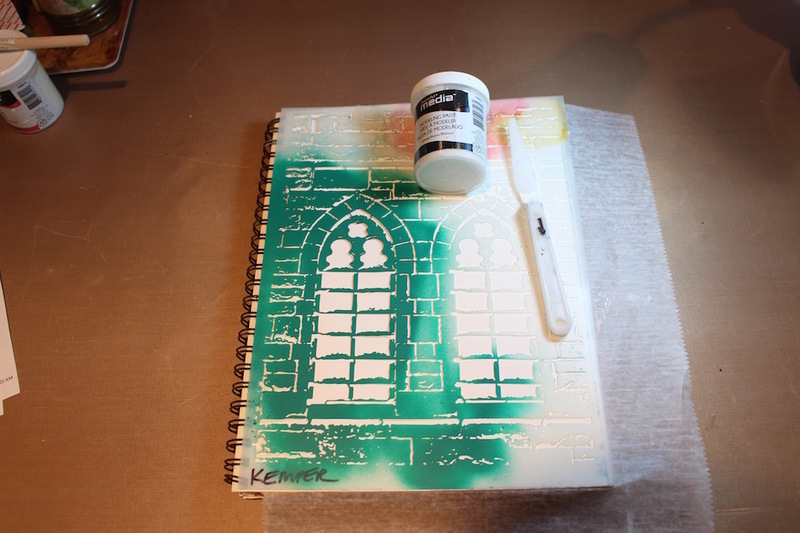 The foam board has been treated in the same way as the main background with paint, stencils, stamps and mark makers. 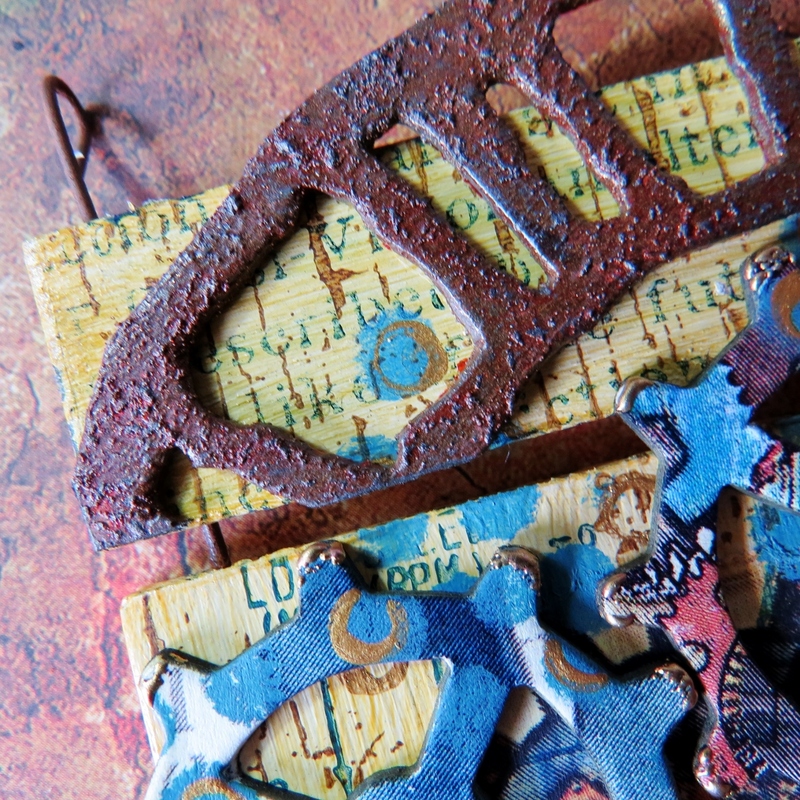 A section of a die cut clock has been rusted using paints and texture medium then applied. 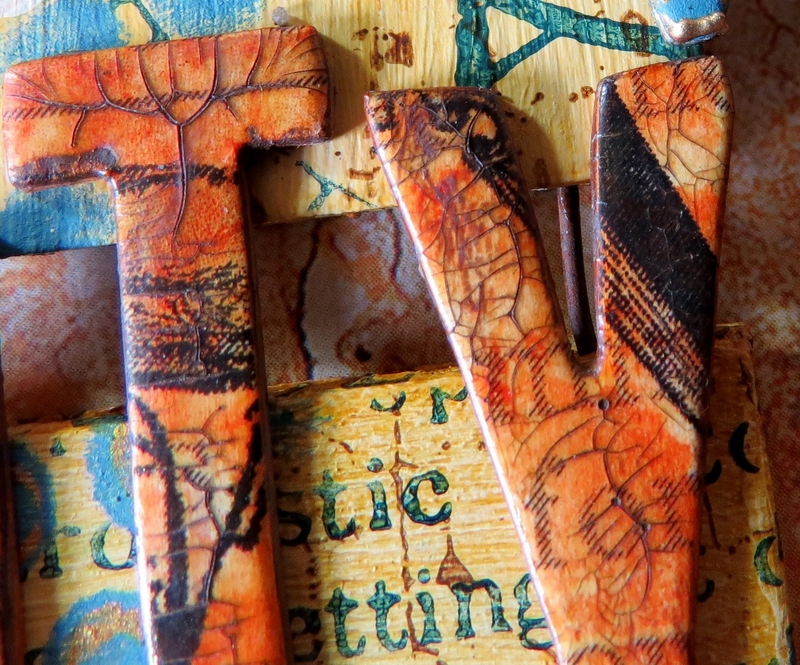 This image shows the bottom piece which is attached with rusty wire (just visible below the letters B and Y) and the die cut mesh which extends from the main piece. The letters are die cut from mount board which has been covered with sections of the Stampington images. They are given a thin coat of quinacridone gold followed by crackle glaze and antiquing with raw umber. The rusty wire is curled around the letter base as described earlier. I hope you enjoyed seeing how I used this fab set of images. I will certainly be going to Stampington again to choose some more images to work with - I'm a convert! Good morning everyone. 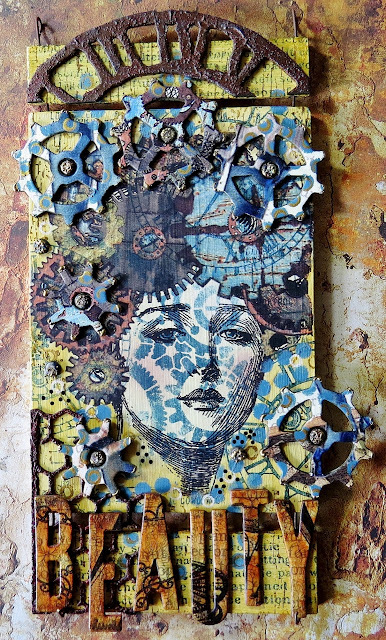 It's my absolute pleasure today to bring you some art from the winner of our 'April Showers Bring May Flowers' challenge selected by the lovely Shari: Joi from Joi @ RR. WOW... WOW... WOW... I am seriously thinking I should pinch myself to be sure that this opportunity to be Top Talent at Our Creative Corner is real. Ok, I did it... OUCH... it hurt so... HERE I AM - ehehehehhe - with a project for you!!! First let me thank Julia for being such a joy to work with - she is sooo precious. And thanks bunches to Our Creative Corner for the chance to make this creation for your Top Talent segment. In Texas, on a 700 acre, family owned ranch. I used to do all the mowing, lots of tractor work, fence fixin', cattle taggin', flower plantin', garden tendin', cookin' - you name it. Now I am older with some health challenges that keep me near the homestead but it is a beautiful place to be. How do you spend your time when not crafting? My favorite thing to do is look at your blogs and leave comments. I love to be an encourager. When I was young, there were few around to encourage me... so now that I am retired - it gives me great joy to be able to send some care and encouragement to my online creative family... YOU. I spend about 6 hours, at least, on the computer every day writing love notes on your blogs. The rest of the time - I paint, do some ranch bookkeeping, and then watch a few fav TV shows like America's Got Talent, Dancing With the Stars, Survivor (reality types). It is hard for me to believe I actually have time for myself now... to do the things I enjoy. I am very blessed in that regard. 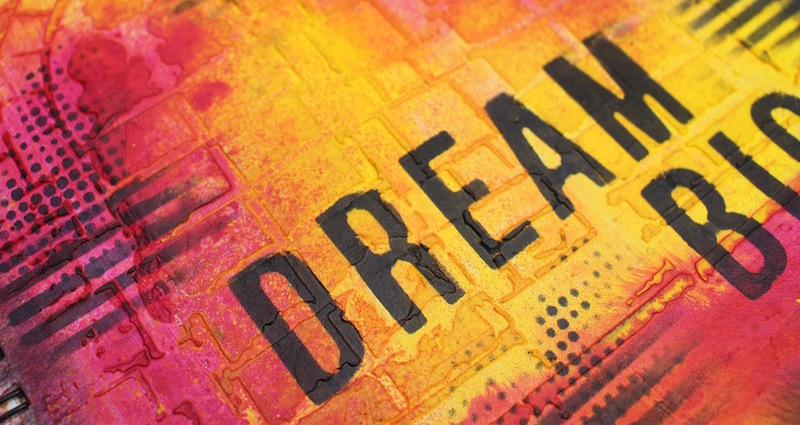 What if anything, do you consistently draw inspiration from? Mood Boards. Your tutorials. Challenges. And just whats in my heart. If you could only use three craft supplies for the rest of your life, what would they be? Paint, paper, mat medium. I mostly paint with my fingers so don't even need a brush! 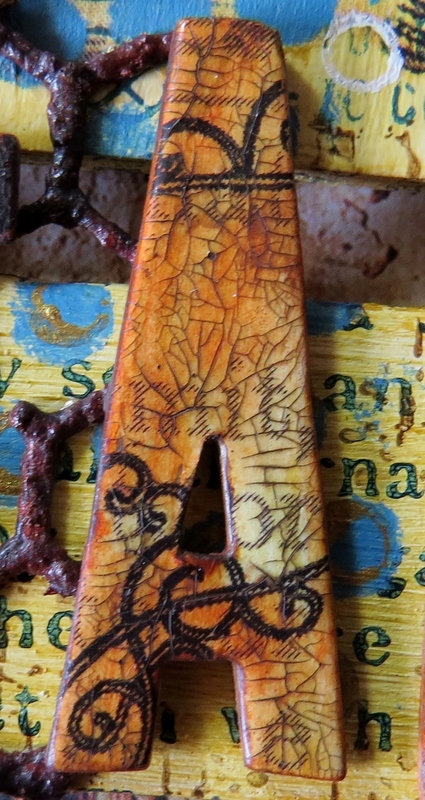 And then I would have hubby cut me wood from trees and sand some rusty metal - all here at the ranch - to paint on! What is your favorite holiday/event to create projects for? For me it's not holidays or events... it's seasons. Wonder if you can call a season an event!!!??? It sorta is!! I love creating for the seasons. Here is what gets me excited: Winter - white, silver, blue and sparkles; Spring - pastels; Summer - bright,bright,bright; Fall - orange, browns, burgundy, teal. Fall is my favorite time of all to create because those are my fav colors. LOVE the ORANGE family! 5. 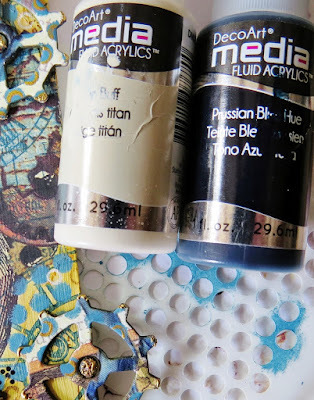 What is the most useless item that you have purchased for your craft?I have just looked all around my studio... and I honestly cannot find one single thing that I have not used in some way. From real grizzly fur, to elk burrs, to real (but dead) ranch bugs and butterflies, various shapes and sizes of wood, metal, dozens of types of paints & inks, papers, 42 bottles of different types of mediums, markers, flowers, ribbon, fabric, gelli plate, my trusty Vagabond and Misti - it's all here... and I use it all. Wish you were here to use some of it with me. I sit here shaking my head - thinking back to how little I have had throughout my life - and realize how very very very grateful I am to be creating with so many incredible items. It's more than amazing. Thank you so much Joi for sharing a little more about you - I'm sure many people will feel as I do and wish we could have a painty play date! Your honesty and passion for what you do is humbling. 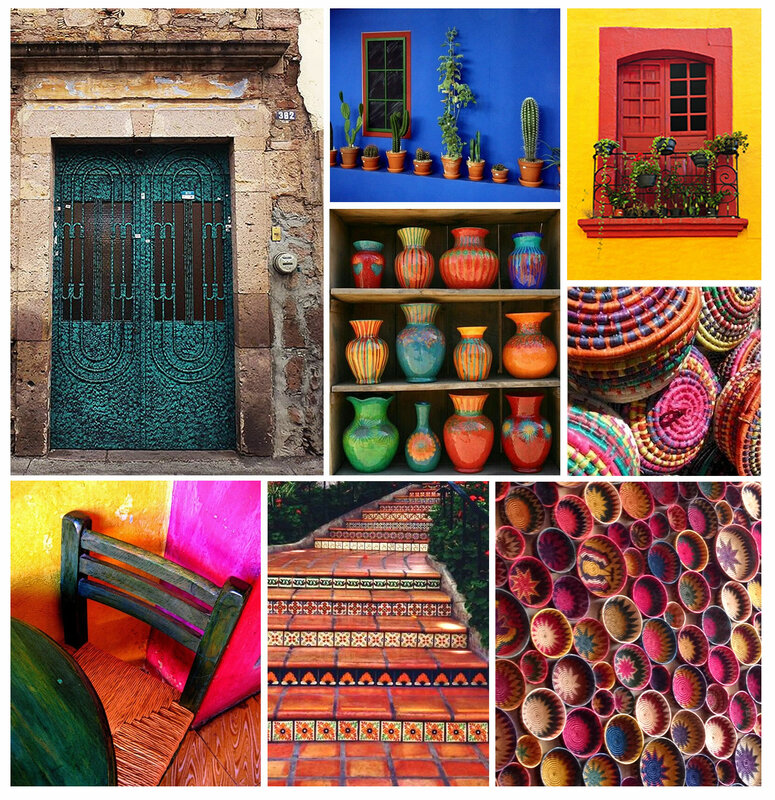 I love door and the bright colors of the Mexico Mood Board for Our Creative Corner's Summer Challenge so I just had to go with that for my project. I named it: 'Pathway To Tomorrow's Bright Future'. You can read more about it here. This 20x24 acrylic painting was a challenge for me... I did things I have never done before - but it was so fun to create this pathway. Thanks bunches and bunches to you all for your sweet comments and ever present support. Big Hugs. j.
Joi, this is absolutely stunning!! I love the colours and the perspective which leads the eye into your painting and makes me feel I could walk down that wonderful walkway. I adore the flowers framing the archway and those amazing little pots which disappear into the distance are just gorgeous with all their detail and design. 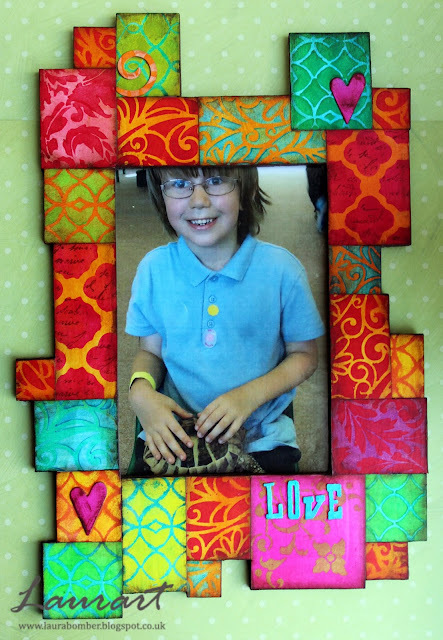 It's so wonderful to see that you have drawn your inspiration from our Summer Challenge moodboard too. For full details about Joi's project please go to Joi from Joi @ RR. and leave her a comment to say you've been! Our current challenge is still open, so if you haven't yet had a play and linked up with us, you'll find all the details here: Mexico Moods. I'm sure that Joi will have given you some inspiration! Remember the rest of the team will be posting their inspiration for this challenge at the start of August so do pop back and have a look. For this designer it is a return to her roots. She appeared at our Creative Corner as a winner in June 2011 and by August she had joined the team - you can find her first appearance on the OCC DT here! 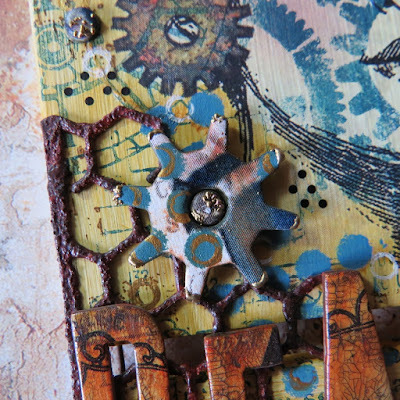 Marjie Kemper here, delighted to be featured on Our Creative Corner. I was inspired by the awesome Mexico Moods board in many ways... the colors, shapes, and visual textures really called to me. 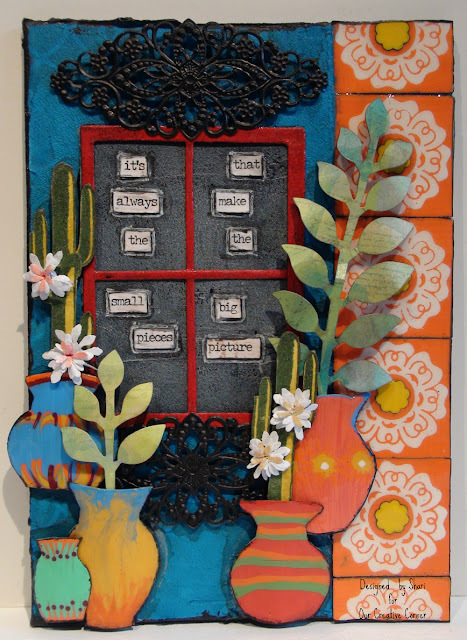 Drawn to the rough metal and the bright colors, as well as the fabulous pots in the picture... I had loads of options for creative play. I started out with a window stencil from StencilGirl Products (designed by Michelle Ward), and spread DecoArt modeling paste through it. 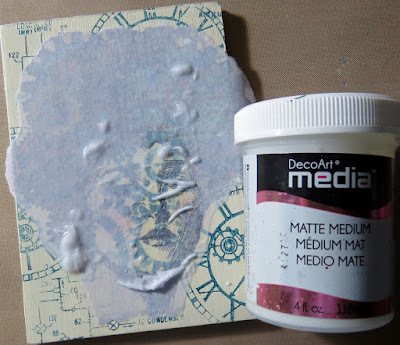 I let it dry overnight, but depending on where you live and how thickly you put it on, you could be ready to move on in as little as 30 minutes. 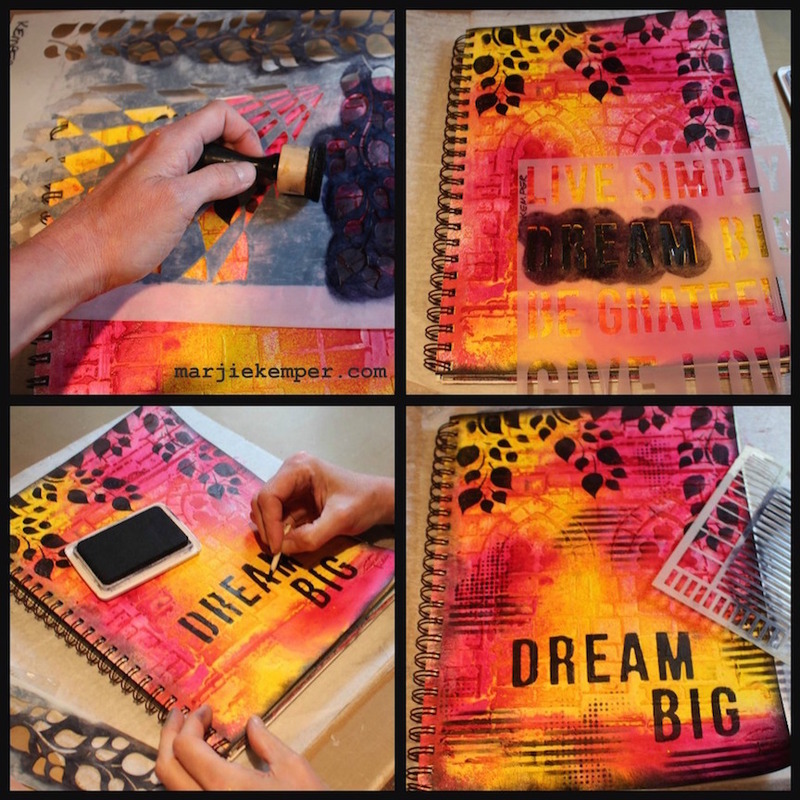 These are DecoArt Media Misters - I love their rich concentrated colors. 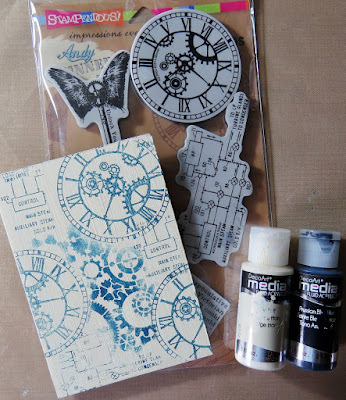 I used a variety of stencils with jet black Archival Ink and an ink blending tool and a little nib to color in the 'gaps' in the word stencil. I hope you enjoyed my take on the Mexico Moods. Please come visit me or find me on social media when you have a chance. I teach classes online and in person, and I'd love to say hello to you. Thank you so much for being here Marjie! It was lovely to have you visit us at Our Creative Corner again and we are thrilled that you have shared some wonderful inspiration with us today. I hope that seeing this beautiful creation will inspire you to come along and play with us this summer. 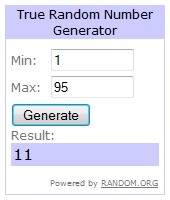 Remember you can enter up to three times! 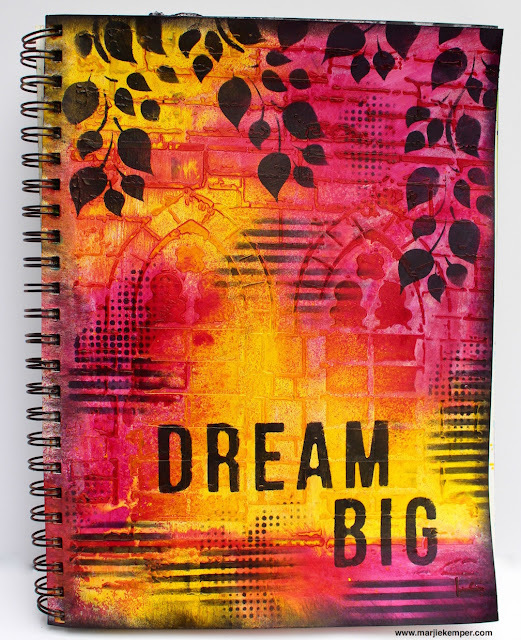 You'll find all the challenge details as well as lots of inspiration from the brilliant Our Creative Corner design team by clicking on the challenge link. I have really enjoyed my month as Challenge Host, I have smiled all the time! Wow, there is an incredible amount of creative talent out there. We will be in touch with you soon to arrange delivery of your Tando Goodies! so difficult from 95 lovely entries! 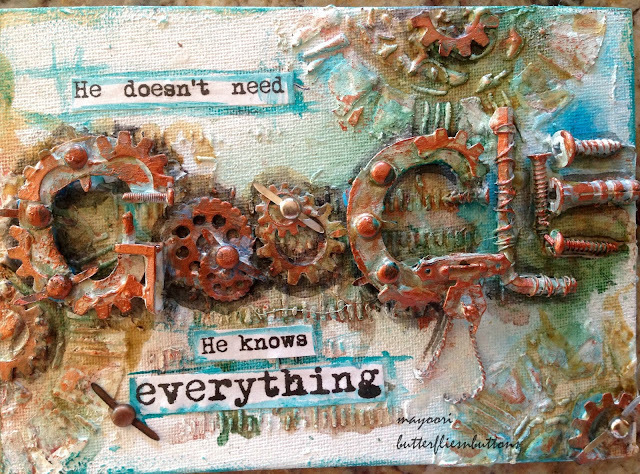 Mayoori, Buttons and Butterflies, her Google canvas for Fathers Day. Brilliant work! I can't wait to see what she will create for our Top Talent spot! 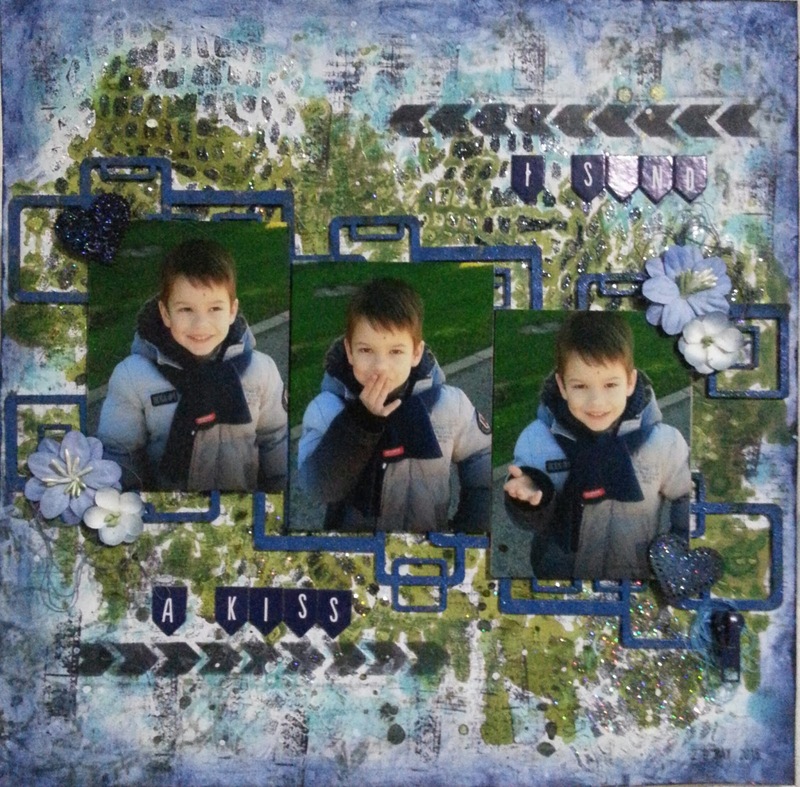 and balance which complimented the photo of her handsome son! 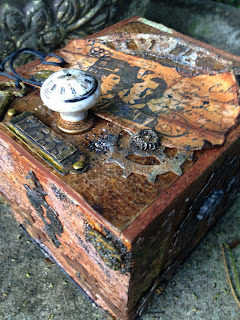 Sara Emily Barker for her amazing cigar box, so many techniques! 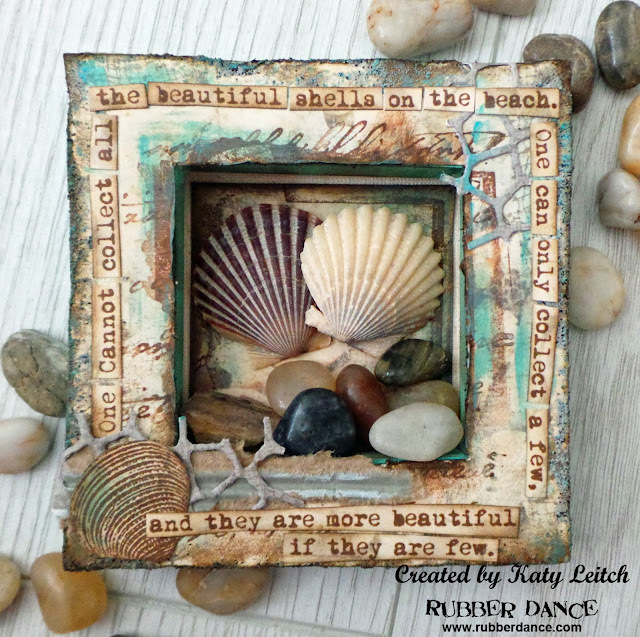 Katy, Postcards from the attic for her lovely memory shadow box of shells! 'Our Creative Corner Top 3' blog badges soon! Check your emails and display them proudly! It is a bit different and is a Team Challenge! Hope to see your creation there. 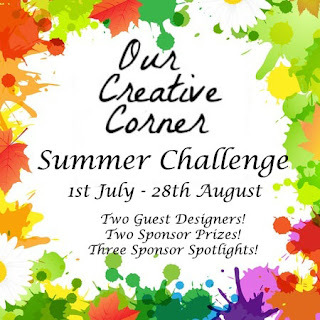 Welcome to Summer here at Our Creative Corner! There is no challenge host for this challenge. This challenge is very much a 'team' challenge and we will all be voting for the outright winner and Top 3. The Guest Designers have been selected by the OCC team and they will appear on 22nd July and 22nd August to share some of their wonderful inspiration for our Summer challenge. 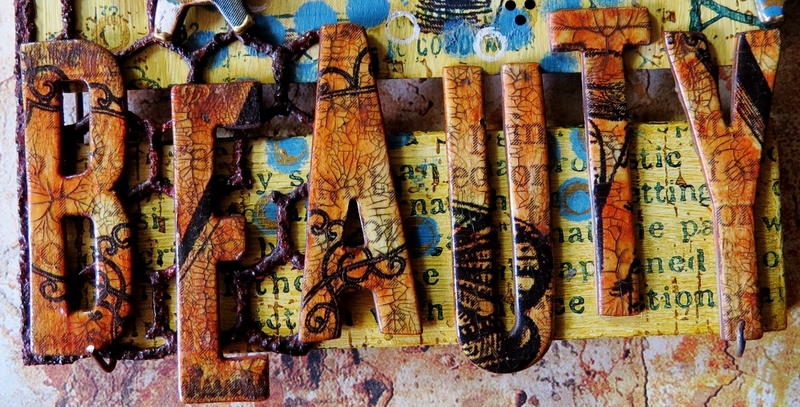 You must come back to see who we chose and their fantastic creations! During these two months there will be three Sponsor Spotlights and we will feature some creations that have been made by our DT for our wonderful Sponsors for July and August. to spend on e-crafting goodies! of their wonderful Tando goodies! Are you eager to know how to take part in this mega crafting and prize winning fun this Summer? 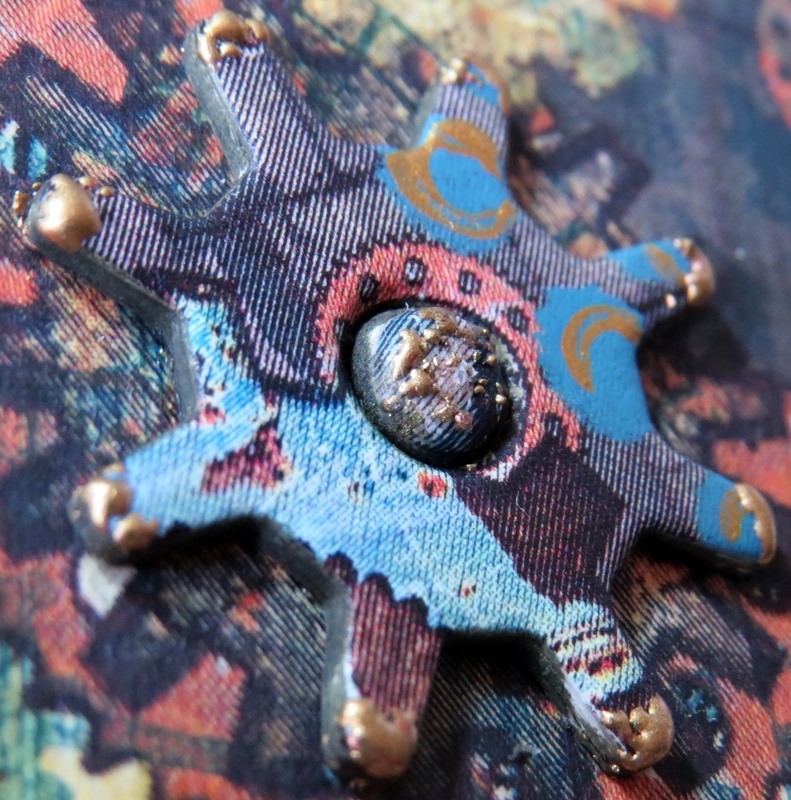 Go for colours, shapes, textures, objects or style...or the whole lot!!! There is certainly plenty of inspiration to choose from here in this selection of glorious, vivid, colourful photographs. Join us in the summer holiday mood....!!! 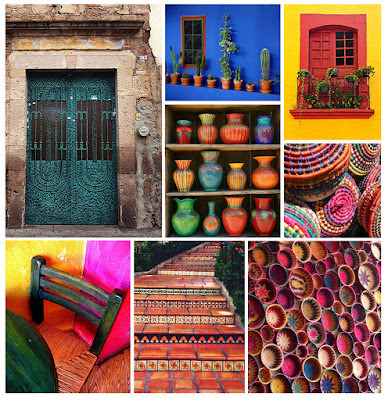 inspiration from the Mexico Mood board! 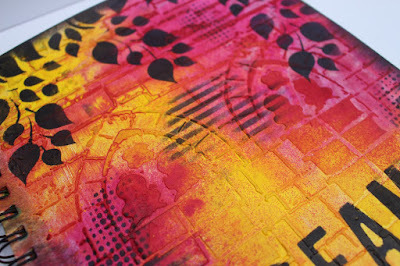 I was inspired by the all the gorgeous zingy colours in the moodboard. I just had to play with my paints, a stencil, some background stamps and one of my favourite little girl stamps. What is better than a travel in a distant land? 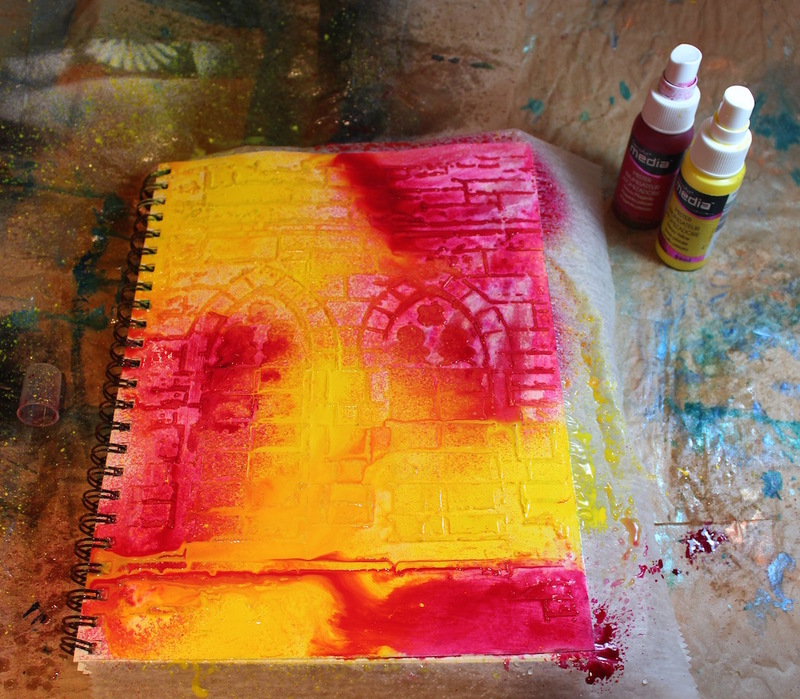 I was inspired from colors, structures and the door. It's a card to wish big joy in vacation. literally taken from the Summer Challenge inspiration image. Do those little pots look familiar? 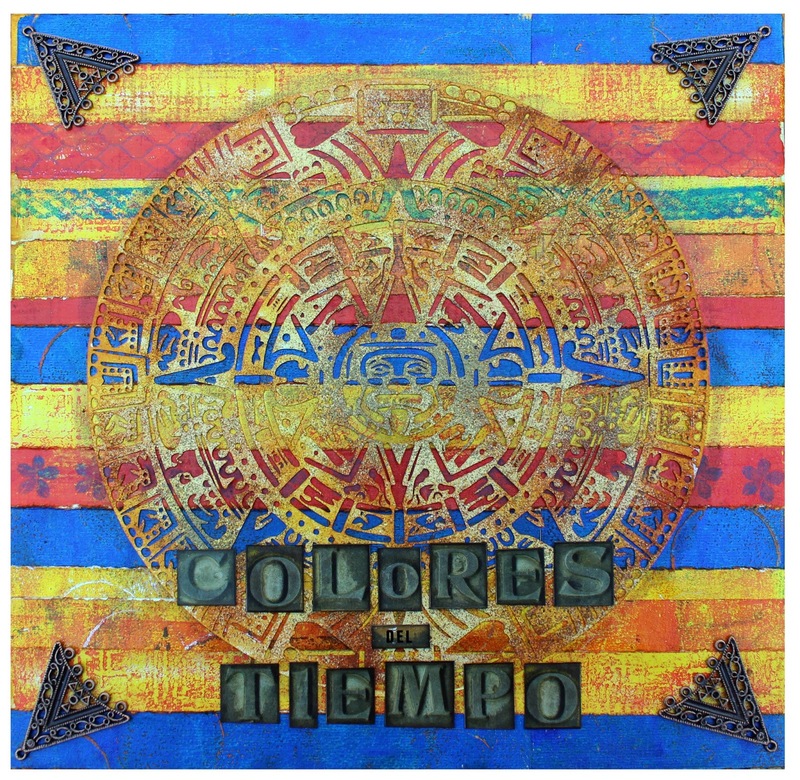 I was inspired by the bright colours and the ancient Mayan culture of Mexico. and orange taken from the mood board! WOW!!! what an amazing summery collection there! I hope you are already full of ideas and ready to join in the summer fun! Remember to come back to check on the GD post, Sponsor Spotlights and next months DT lineup....you won't want to miss any of it! Love from The OCC team!